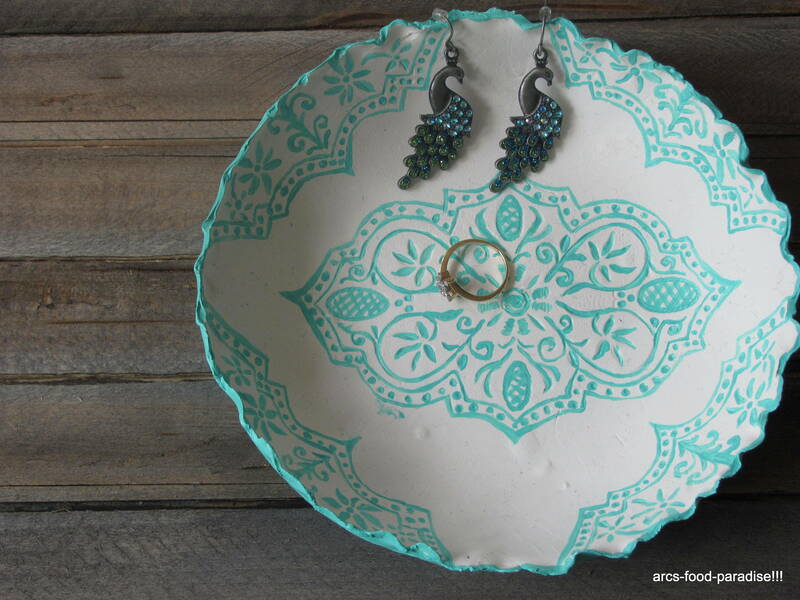 DIY Polymer Clay Jewelry Dish | The Flavor Nook! 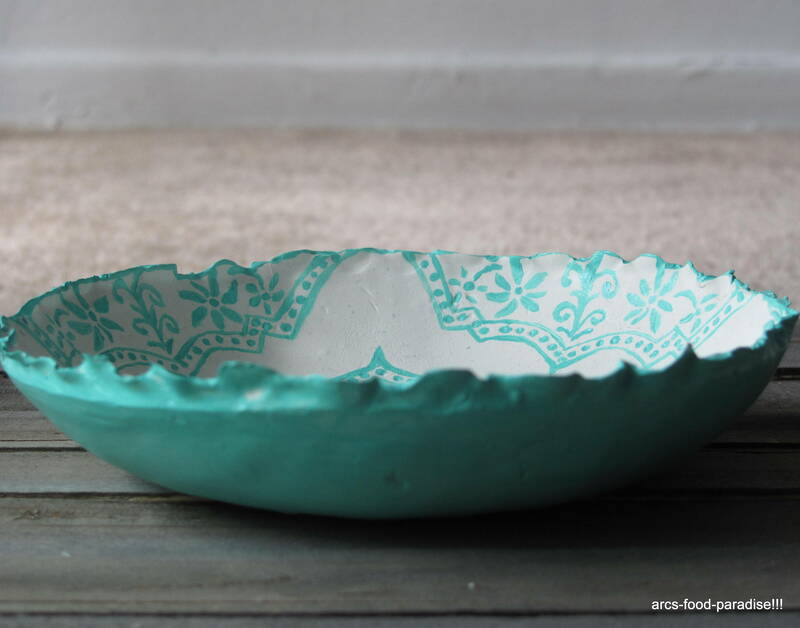 I’ve been following this very creative blog ‘Diary of a mad crafter‘ recently and came across a lovely jewelry dish she made using polymer clay. (She has lots of fun craft ideas with tutorials….be sure to check out her blog!). It inspired me to make one myself. 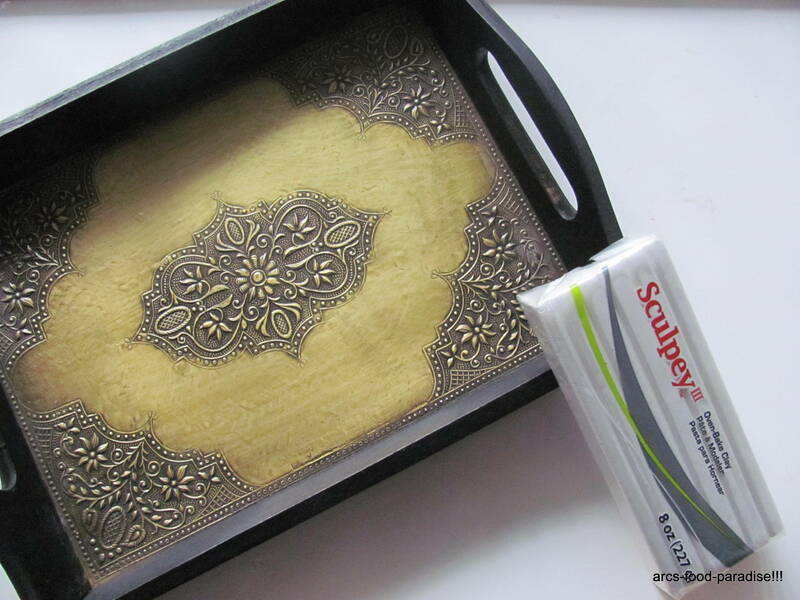 I have never worked with polymer clay before, but while making this jewelry dish I realized how easy and fun it was to work with. – I took about 4 oz of polymer clay, placed it in between a ziploc cover and rolled it into a circle of about 1/4th inch thickness. 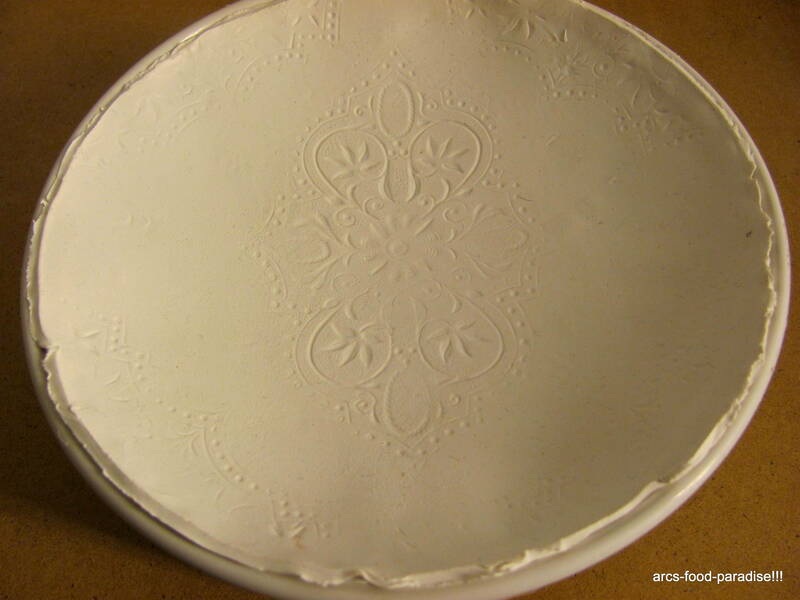 – I took a oven-safe dish and cut out the clay into a smooth circle and gave the corners a light design. – I have a nice hand-crafted tray that I recently bought from back home and really wanted to use this design on my dish. 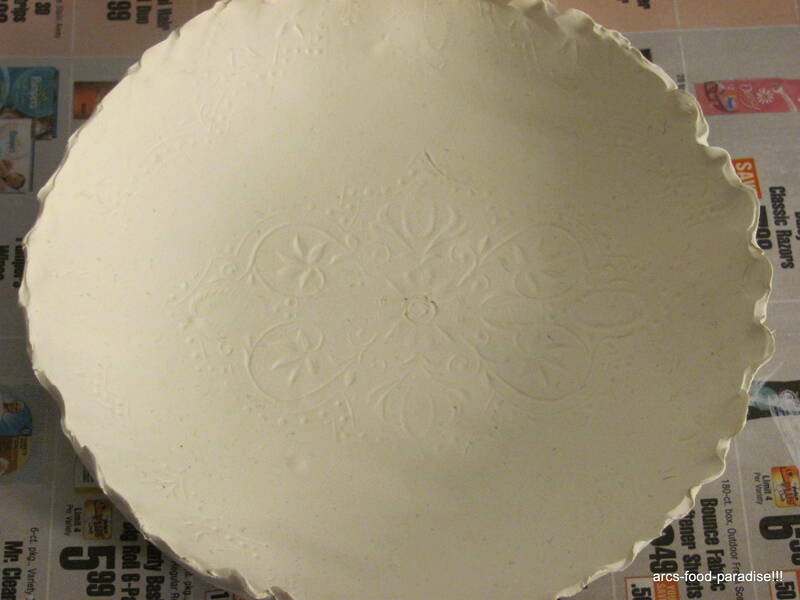 So, I placed the clay on the tray and lightly tapped on the clay so that the design was embossed on it. I repeated the same for the corners. – Now, it was time to bake. I placed the clay into the oven-safe dish and baked it at 275 deg F for 10 minutes. Took it out from the dish and then placed on a baking sheet and baked for a further 10 mins. Remove and let it cool down. (After baking, I thought the clay would be hard. But, was confused when it was still quite flexible. So, did a little research and found out that it will become hard after it cools down a little). – I considered different colors but finally decided on the light neon blue. 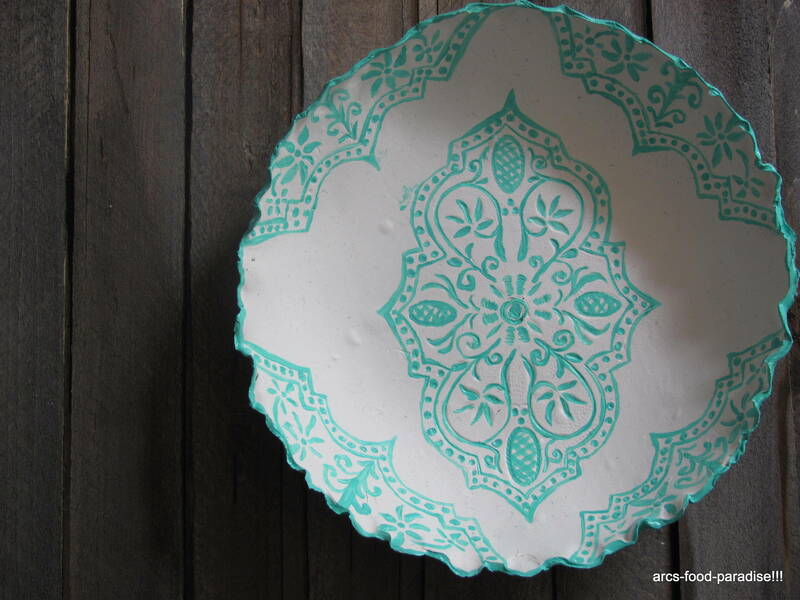 I chose to paint only the design and the bottom of the dish. I think it came out pretty well. I guess I’m going to make some more of these and use them just as accent pieces for decor! Pingback: A look back & a step forward « Food Paradise! Pingback: Polymer Clay Vase – DIY | Food Paradise! Pingback: Turquoise Painted Glass Vase with a touch of yarn! | Food Paradise!!! thanks a lot! 🙂 you could make the design with pretty much anything you have! try it out! I just posted a plant hanger I made with this clay and had never used it before… was also surprised that it doesn’t really harden like you’d expect. Still, it’s fun to play with and I love what you did with it. There’s always a use for pretty little bowls! Congrats on getting FP’d. It happened to me a couple weeks ago and it’s totally fun. Lovely blog… deserving, indeed! yea i was surprised too when it didn’t harden as I expected it too…no qualms though :)…..i’m certainly overwhelmed on being freshly pressed..all these comments are so encouraging……..thanks a lot for your kind words! Amazing, I had no idea it was this easy! I live in London and trying to get hold of a decent holder for your jewellery that’s a) not mainstream and boring, b) can actually hold a decent amount of jewellery – I have a habit and I’m not ashamaed to admit it! and c) doesn’t break the bank, is pretty damn near impossible! I love Diary of a Mad Crafter! She inspires me, as have you! :)….thanks….i too loveee her blog! I love how this looks, so elegant! And so well done with the painting, it looks beautiful. Thanks a ton!!! for your comment :)…..and also the mention in your blog!….glad you liked it.